An electric car recharges at a loading station in Frankfurt, Germany. For now, car companies are aware of the issue but aren’t too concerned that a cobalt supply crunch will have an immediate impact on their plans. BMW, which makes the i3 electric car, is “currently in negotiations with several cobalt suppliers in order to buy cobalt directly from mines,” and so far “does not see the risk of a bottleneck in its cobalt supply chain,” spokesman Kai Zoebelein told Bloomberg Environment. GM has plans for 20 all-electric models by 2023 and is confident it can deliver “based on future forecasting discussions with our suppliers,” Katie Minter, spokeswoman for GM division Chevrolet, told Bloomberg Environment. But current estimates of the speed at which electric vehicles will take to the roads could be too cautious, meaning any shortage in cobalt supply could become a problem sooner than expected, Bo Normark, leader of smart grids and energy storage for InnoEnergy SE, told Bloomberg Environment. InnoEnergy is a company set up with EU backing to invest in sustainable energy projects. “We are approaching a time when electric cars become very competitive,” especially in the EU, which has higher gasoline prices than the U.S., Normark said. This could mean “volume expansion is underestimated,” and the potential shortage of cobalt could start to bite in the early 2020s, he said. According to the EU Joint Research Centre report, the number of electric cars worldwide will jump from 3.2 million in 2017 to 130 million in 2030. To put that in context, there were some 1.8 billion registered vehicles in the world in 2013, according to World Health Organization data. 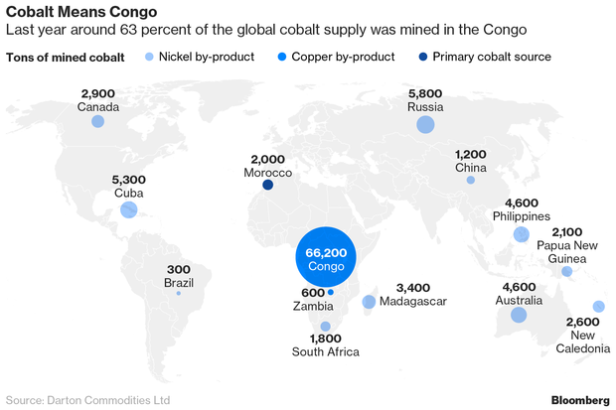 Mining companies that produce cobalt, most of which—about 63 percent—comes from the Democratic Republic of Congo and comes with its own environmental and human rights concerns, are feeling the effects of the electric car rollout. The price of the commodity jumped sharply in 2017 and early 2018 and remains more than double its price at the end of 2016. Bloomberg NEF estimates that by 2030, global demand for cobalt could be 47 times more than it was last year. “There’s a paradigm shift in the market” in connection with technology-related applications for cobalt, which was seen as a “very specialized and perhaps curiosity metal for quite some years,” David Weight, president of the Cobalt Institute, told Bloomberg Environment. The institute represents cobalt producers and users including Freeport Cobalt and Glencore International AG. According to Cobalt Institute data, the world refined cobalt supply in 2017 was 116,937 metric tons. About half of the world’s cobalt is refined in China, Weight said. Glencore’s 2017 annual report said an additional 314,000 tons of cobalt will need to be found by 2030. The company plans to increase its cobalt production by 133 percent in three years, according to the report. Glencore spokesman Charles Watenphul referred a Bloomberg Environment request for comment to the company’s reports. Linda Hayes, spokeswoman for Freeport-McMoRan Inc., an affiliate of Freeport Cobalt, said the company was unable to comment. To tackle the potential cobalt shortage, car companies and their battery suppliers could reduce the amount of the metal they use, eliminate cobalt from batteries altogether, or find new sources, including from the recycling of used batteries. Work to reduce the cobalt content of batteries is “progressing quite well,” but “for sure cobalt will be with us for a very long time,” Normark said. Car companies could switch to alternatives if they become available. GM “continues to evaluate a wide variety of battery chemistries for performance, cost and safety,” Minter said. Nissan, which produces the LEAF electric car, is “exploring a range of technologies that will move us towards a more sustainable transportation landscape,” spokeswoman Sara Jenkins told Bloomberg Environment. The expected rising demand for electric vehicles “opens the doors for us to explore alternatives” to batteries containing cobalt, she said. Recycling will be vital because, although “there will not be a problem with cobalt supply in the first wave of electrification, there will certainly be problems of supply after that,” Marjolein Scheers, spokeswoman for metal refiners and recyclers Umicore NV told Bloomberg Environment. Umicore has built a pilot plant for recycling electric car batteries, which will be “a must for environmental and resources reasons,” Scheers said. But ultimately, new sources of cobalt will be needed, especially in the late 2020s, when national and EU plans to switch to electric vehicles will start to have widespread effect. Normark agreed the EU should mine more of its own cobalt in addition to recycling. Finland is the only EU country where cobalt is mined, though Spain, Sweden, and some other EU countries also have reserves, according to the report. Mining in the EU would be more expensive than importing from the Democratic Republic of Congo but, in the context of improving battery technology to minimize cobalt, “the battery industry can live with a higher cobalt price,” Normark said.